BlackBerry plans to launch the Passport in September, but luckily for everyone who has been expecting it, a detailed review has surfaced before its debut. It comes courtesy our Czech colleagues from Mobilenet.cz and reveals just about everything about the smartphone. Inside the BlackBerry Passport there's a Qualcomm Snapdragon 800 MSM8974 chipset with a quad-core 2.2GHz Krait 400 CPU, Adreno 330 GPU and 3GB of RAM. There is also 32GB internal memory, which can be expanded further via the microSD card slot. The battery is quite large in capacity at 3,450mAh but because the phone didn't stick around for long, there was no time for a proper battery test. The phone measures 128x90.3x9.3mm and weighs the massive 195 grams. At the back, there's a 13MP camera with LED flash and 1080p@60fps video recording capabilities. It has optical image stabilization, too. While there's NFC and LTE connectivity options, the Passport's Wi-Fi is limited to 802.11n only. The 4.5" display of 1440x1440 pixel resolution boasts a pixel density of 453 ppi. It's also covered with a protective layer of Gorilla Glass 3. The review reveals that the phone feels really sturdy and is built to last. On the side, there's a steel frame, while the back is made of soft touch material to be less slippery. One of the most interesting features of the Passport is its keypad which doubles as a large touchpad. There are few interesting gestures available. One of them is the ability to quickly delete words by swiping to the left. The keyboard itself is fantastic to write on, but one handed use is quite hard as the phone is just too wide. Lastly, the review mentions the phone's availability in Europe, which will happen in October. The price of the Passport is quoted at $760 (CZK16,000). 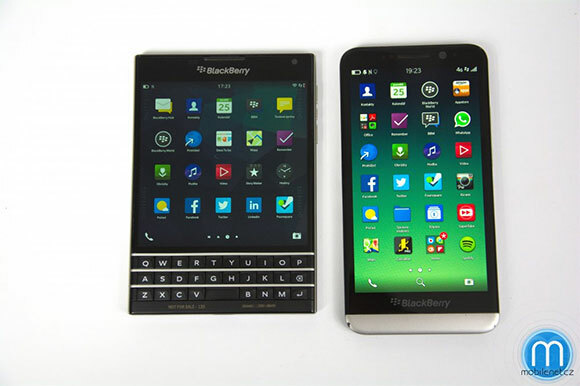 Follow the source link to check out more live photos of the BlackBerry Passport. I was thinking to buy Moto X2. Now I am giving much thought on this one. Afraid not dear boy...it's not a rejigged Z30 at all. This I know due to the fact that I'm posting this from a BlackBerry Passport.